The purpose of this article is to serve as a general strategy guide with tips and advice that you should follow when attempting to win an ice cream challenge. There are very many different varieties of ice cream challenges, and they come in all shapes and sizes. Some challenges may involve actual real ice cream, while others have soft serve, frozen yogurt or frozen custard. Some restaurants only have two or three flavors of ice cream to choose from, and other restaurants may have fifteen or twenty options. Some challenges only involve one or two toppings while others have five to ten different toppings added, and sometimes even more. This little restaurant may have an eight scoop sundae challenge while that restaurant has an eighteen scoop ice cream challenge. Even then, the scoop sizes vary between restaurants, so an eight scoop sundae may actually be larger than a twelve scoop ice cream challenge. There are even some sundae challenges that involve entire pieces of fruit (bananas) along with cookies, brownies, and other bit sized treats. Even though there are many different variations that you may encounter, the basic strategy that you need to have remains similar for every variation. Before we go into the specific strategy details for winning an ice cream challenge, please make sure you have read and understand our Basic Strategy For Winning A Food Challenge article. That article is full of 14 different basic strategy tips that will not be included in this article, which you also need to understand before attempting an ice cream challenge. Please start off by watching our very informative How To Win An Ice Cream Challenge video so that you can visually see all of our different tips put into practice during an actual ice cream sundae challenge. For this video, I attempted The Train Wreck Sundae Challenge at Whistle Stop Depot in Ferguson, Missouri. 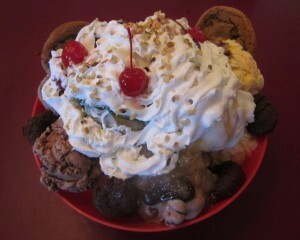 In this challenge, there are 13 very large scoops of frozen custard (3 flavors to choose from). They are topped with 16 ounces of the candy or fruit topping you choose, and then 16 ounces of a sauce that you choose. I had thirty minutes to finish and get the meal free. 1. If you get to pick your ice cream flavor(s), keep them simple – For some ice cream challenges, the restaurant has already pre-selected which flavor(s) of ice cream you must eat with your sundae. You may have to eat one particular flavor of their choice, or you may have to eat one scoop of every flavor that they serve. If this is the case, you just have to adjust and conquer. If you are actually allowed to pick which flavor(s) you want, then make sure to keep your choice(s) simple. You don’t have to pick just 1 plain flavor, but you should not voluntarily select 5 different flavors either. Avoid really sweet and rich options if you can because one scoop may taste great, but you won’t want to eat 10 of them. In the 13-scoop challenge for the video, I chose 10 scoops of vanilla and then 3 scoops of chocolate just to mix things up slightly, but not too much. Remember that your main #1 priority is to win, and enjoying the challenge is secondary priority #2. It will be much easier to eat 18 scoops of vanilla and chocolate ice cream rather than 4 scoops of cookie dough, 4 scoops of brownie batter, 4 scoops of birthday cake, 3 scoops of cappuccino, and 3 scoops of strawberry cheesecake. Mixing up all those flavors in your stomach may give you a stomach ache after a while, and it will be harder to finish the challenge if your stomach is not feeling well. You will have a much better chance of winning if you keep your choice(s) simple. 2. If you get to pick your topping(s), avoid the extra rich options – As mentioned above, many restaurants already have pre-selected toppings like sprinkles and chocolate chips that are served with your challenge sundae, and you just have to adjust and conquer in those situations. If you get to choose though, make sure to again keep things simple and avoid making the challenge harder on yourself. For the challenge in the video, I was able to choose between many different options such as peanut butter cups, pineapple, cookie dough, gummy bears, Butterfinger, and brownie bites. I really enjoy small concretes with cookie dough, brownie bites, and other rich toppings, but I did not want to eat a full pound of cookie dough or brownies along with 13 huge scoops of ice cream. Therefore, I selected strawberries, which ended up being a brilliant decision because they were light and went down very easily. I definitely recommend choosing light options like fruits rather than rich toppings like cookie dough that will sit heavily in your stomach. This will save calories too. If you can choose, pick toppings that you know you can eat a lot of rather than basing it on what flavor(s) you enjoy the most. 3. If you get to pick your sauce(s), avoid the extra sweet options – If the sauces on your challenge sundae are not already pre-selected, do your best to avoid the very sugary options like chocolate sauce. All of the choices will have sugar in them, but some have more than others. For the challenge above, I was able to choose between hot fudge, caramel, chocolate sauce, and strawberry. Chocolate sauce is basically like drinking straight sugar, I had already chose real strawberries as my topping, and I knew I would not enjoy 16 ounces of caramel, so I chose hot fudge as my sauce topping. Hot fudge was also the only option that had some texture to it (it thickens as it cools), and I knew that would make the challenge more enjoyable later on once the ice cream started melting. Select which sauce(s) you want after you have already chosen your ice cream flavors and toppings. Pick ones that compliment your flavor(s) and topping(s), but avoid ones that you know you won’t want to eat a lot of. 4. Take digestive enzymes to help your body handle the lactose – This is completely up to you and this will not be necessary for everyone, but you may want to look further into taking some kind of digestive enzymes or lactase supplement before your challenge if you are worried about how your body will react to the dairy and lactose in the massive amount of ice cream you are about to consume. There is more information about digestive enzymes in the After The Challenge section of our TIPS category. The human body was not built to digest that much dairy at one time, so taking a digestive enzyme supplement before your challenge will help your body better handle the digestion process so that you don’t feel miserable for an abnormally long time after your BIG challenge. 5. Prevent the ice cream from touching the roof of your mouth – BRAIN FREEZE!! That is what happens when something really cold comes in contact with the roof of your mouth. When you consume a “frozen” drink through a straw, you are likely to get brain freeze because the liquid comes right out of the straw and hits the roof of your mouth if you are not careful. Using a straw during your challenge once the ice cream begins melting is up to you and not recommended, but don’t let the ice cream hit the roof of you mouth if you do. When using your spoon to eat the ice cream, twirl the spoon once it is in your mouth so that the metal or plastic comes between the ice cream and the roof of your mouth. More than likely, you will get brain freeze once or twice during the challenge, especially if you are trying to eat it really fast, but do your best to avoid it. If the painful feeling does start creeping up on you, take a break and sip on warm water until it goes away and you can start eating again. 6. Drink warm water and/or black coffee to fight the coldness – If there is one undeniable fact that can be drawn from your upcoming ice cream challenge, it is that the ice cream is going to be COLD. It is going to be cold on your entire mouth, especially if you have sensitive teeth. You will definitely want to have a glass or two of warm water readily available to sip on during your challenge whenever your mouth starts feeling really cold. You may also want to have a cup of hot black coffee with your challenge too. You will NOT want to drink soda or lemonade during this challenge to help switch up the flavor. You will want something warm!! Hopefully the sauce(s) and topping(s) are helping with the flavor, but the black coffee will help with the flavor too if necessary, if you like coffee. Every restaurant that I have ever been to for an ice cream challenge has been more than accommodating regarding giving me a glass of warm water, so getting warm water should not be an issue. As for coffee, you may want to ask beforehand if the restaurant has it available. If they don’t serve coffee, but know that you will want it during the challenge, bring your own in a thermos to keep it warm. It is better to be safe rather than sorry!! 7. Use a large spoon to take big bites and eat the ice cream faster – The easiest way to fail a food challenge is to simply take small bites the entire time. You will take forever to finish everything and you will more than likely get too full or run out of time before you can finish. You will also take forever if you eat with the small spoon that the restaurant will more than likely give you to eat with. Either ask for a larger serving spoon or bring your own large spoon so that you can use it to take larger bites of ice cream. I bring a large spoon and fork to every challenge that I attempt, even if I know that I won’t need them. They are always available, and I suggest that you bring your own large spoon too. Don’t leave it up to chance and depend on the restaurant for one, because you may end up disappointed. It is virtually impossible to choke on ice cream, so scoop up large bites and eat some ice cream!! You are not at your grandparents house or on a first date. Take large bites and make sure to twirl the spoon to avoid brain freeze. Avoid “chewing” the ice cream too because chewing won’t be necessary, especially once the ice cream starts melting and becomes very soft. That obviously does not apply when there are large chunks of topping included with the ice cream. Get the ice cream down quickly and get the challenge victory!! 8. Dip your spoon into hot water between bites if necessary – This won’t apply to you if you are attempting a soft serve, frozen yogurt, or frozen custard challenge because your ice cream will be soft from the very beginning and you won’t have any issues cutting through it with your spoon. There are some challenges though that involve very high quality real ice cream that is very thick and fatty, and it will be very hard and tough to slice through at the very beginning of the challenge. If you run into this issue, ask for a separate cup of hot water. In between every few bites, dip your metal spoon into the hot water so it can heat up and then slice more easily through the thick ice cream. Once it becomes tough to slice through again, dip the spoon back into the water and let it heat up. Just continue repeating this process until the thick ice cream softens and you no longer have this issue. 9. Start from the top and work your way down to the bottom – With most other food challenges, all of your food is just sitting on a big tray in front of you and you have easy access to separate the different components and break things apart, and then move things around based on your strategy. With an ice cream challenge, which is most similar to a big pasta challenge, the ice cream, sauces, and toppings are all combined together and layered in a big bowl or serving dish. You cannot just reach in and take out the cookies and bananas and other toppings that are beneath 6 scoops of ice cream. Therefore, you just have to start at the top and work your way down to the bottom. Most sundaes have whipped cream on top, so start with combining the ice cream with that and then just keep on eating. When you reach a big cookie or brownie, you can either take it out or just eat it along with the ice cream. Just don’t stop eating!! If the sundae is served in a pan or tray rather than a deep bowl or serving dish, it will be easier to separate things, but in the end it does not make much difference. Focus less on how you are eating the entire challenge, and more on just getting everything consumed so that you can get the victory. 10. Save the brownies and cookies until later on in the challenge – If your challenge sundae includes large cookies, brownies, or some other large treat placed on top or on the sides, it is recommended that you separate them all off to the side so that you can consume them later on towards the end of the challenge. If you eat enough of anything, even your favorite foods, you will eventually get tired of the texture and flavor and begin suffering from flavor fatigue. You will no longer enjoy eating that particular item. If you are eating 18 scoops of ice cream, you will more than likely eventually get tired of eating ice cream and want something to go along with it. Because you saved your cookie(s) and brownie(s), you now have something to eat with your ice cream!! This will help switch up the flavor and texture in your mouth, and then you will be able to go back to finishing the rest of the ice cream. Note that these separate treats are not to be confused with the toppings in or on your sundae though. Eat those like normal with the ice cream. If you come across a layer of brownie in the sundae, eat it all then and don’t worry about separating. Just make the best decisions you can as you continue eating. 11. You may want to bring a sweatshirt to stay warm – If the challenge you are attempting is huge and there is a very large amount of ice cream involved, consider how your body is going to feel with all of that cold ice cream inside of it. It may be summer time and the air conditioning at the restaurant may even be broken, but your internal temperature is going to be very cold with all of that ice cream inside it. For this reason, especially if the restaurant keeps the inside temperature very cold, you may want to bring along a sweatshirt or hoody to wear once you start feeling cold. The extra article of clothing will both keep your body warm and provide your mind with a sense of comfort & warmth. Then you can continue eating happily without feeling like you are freezing. 12. Help melt the ice cream by mashing and mixing it up – Whether your challenge involves real ice cream, soft serve, frozen custard, or frozen yogurt, your ice cream is eventually going to melt. The type of ice cream only decides how quickly it will start melting. Soft serve with obviously start melting sooner than high quality real ice cream. You can help speed up the melting process by stirring, mashing, and mixing all of the ice cream up. Stirring ice in a cup of water will make the ice melt significantly much faster than it would if you just let it sit there and melt without moving. The same theory works for ice cream, so grab that spoon and mix the ice cream up in between bites. It may not be necessary or worth all of the effort in the beginning when the ice cream is still cold and thick, but mashing the ice cream is definitely recommended once the ice cream starts melting and you are already 1/3 done with the challenge. As you continue stirring and mashing, it will continue to get easier to mix, and eating the ice cream will get easier too. This is another reason that you should stick with simple ice cream flavors. Towards the end, all of the flavors will be mixed up into one anyway, and 10 flavors combined my not taste that great. You don’t want to be eating something that you don’t like late into a challenge when you are starting to fill up. You will be more prone to getting sick, and you definitely don’t want that to happen. 13. Drink the melted ice cream when possible towards the end – With the same spoon, can you scoop up more solid ice cream OR liquid soup broth? The answer is obviously ice cream. Once the ice cream completely melts though, it basically becomes like the soup broth, and you can no longer get much on your spoon. We mention that you need to take big bites while eating the ice cream so that you can quickly get the challenge finished, but you cannot scoop much ice cream when it is melted into liquid form. It then becomes much more productive and efficient to just pick the bowl or serving dish up and drink the melted ice cream. Since the liquid is no longer really cold (hence why it turned into a liquid), you can drink a lot of it fairly quickly as long as you have the stomach space available. Drink the melted ice cream whenever possible, and then continue eating the solid ice cream with your big spoon. Don’t waste precious time trying to scoop up the liquid ice cream with your spoon. 14. Advice to help you train for the challenge – Eating four pounds of ice cream is completely different than trying to eat four pounds of steak, and therefore training for each particular challenge is slightly different too. For a steak challenge and most other challenges (excluding spicy ones), you mostly just need to make sure that you have the proper stomach capacity available to fit all of the food inside your body. There aren’t too many other conditions that you need to focus on during your bodily preparations. You obviously need to strategize and train your stomach capacity before your ice cream challenge, just like before all other challenges, but you also need to prepare yourself to deal with the intense “coldness factor” of the giant sundae. Every single bite is basically going to be super cold, which is different than every other challenge besides milkshake challenges, and you need to be mentally ready to handle that. It is not recommended or necessary to just go to the grocery store and purchase multiple large containers of ice cream so that you can train, but you may want to consider trying to drink a lot of super cold milk (fat % does not matter) in one sitting rather than training with other liquids during one or two training sessions the week beforehand. Take the gallon straight out of the refrigerator and start drinking. Get your mouth, throat, and body used to how cold they will feel throughout the challenge. This will also let your stomach get used to processing the excessive amount of dairy and lactose that you will be consuming. Casually eating a bowl of ice cream while watching television will not help your preparations much, but the few minutes you spend drinking all of the milk definitely will. Note that the amount of milk you drink depends on your own personal capabilities and how your body reacts to cold milk. No specific quantity can be recommended or mentioned. Just know that quickly drinking 1 cup (8 ounces) at a time is not considered real training. If you want to win your challenge, prepare like you want to win, but be careful and don’t overtrain. If you combine the tips above with the Basic Strategy Tips For Winning A Food Challenge, you have all the major advice that you need to plan the strategy you will use to dominate your next ice cream sundae challenge.